Auckland-based airline, Barrier Air, today announced a significant increase in flights to Kaitaia, based on the success of their existing 6 day a week service to the Northland town. The changes will be effective from the 4th of March 2019. The airline has been flying to Kaitaia since 2014. Barrier Air CEO Nick Pearson says, “demand for air travel to Kaitaia has been growing in recent times thanks to a healthy tourism market and Barrier Air’s focus on delivering the people of the Far North reliability, quality service and value”. The additional services will operate during the middle of the day on all days except Tuesdays initially. This will give passengers more flexibility as to when they would like to fly. “The new flights will be particularly useful for those recreational passengers seeking cheaper off-peak flights or connecting with international services” Pearson says. “We are committed to servicing Kaitaia and the Far North Region well into the future. We have developed a reputation as a reliable and trusted airline thanks to a new fleet of modern turbo-prop aircraft and our focus on providing personalised and friendly service. We have recently acquired a third 14-Seat Cessna Grand Caravan in order to service the Far North and add capacity our scheduled services to Great Barrier Island. With increasing the frequency to Kaitaia we are excited to give the residents and visitors to Kaitaia a more regular service with 12 return flights per week “. The new schedule will depart Kaitaia bound for Auckland at 0650 and 1240 (except Tuesdays) and the Auckland to Kaitaia flights will operate at 1100 and 1815 (except Saturdays). The late-night Friday departure for Auckland at 1935 remains. 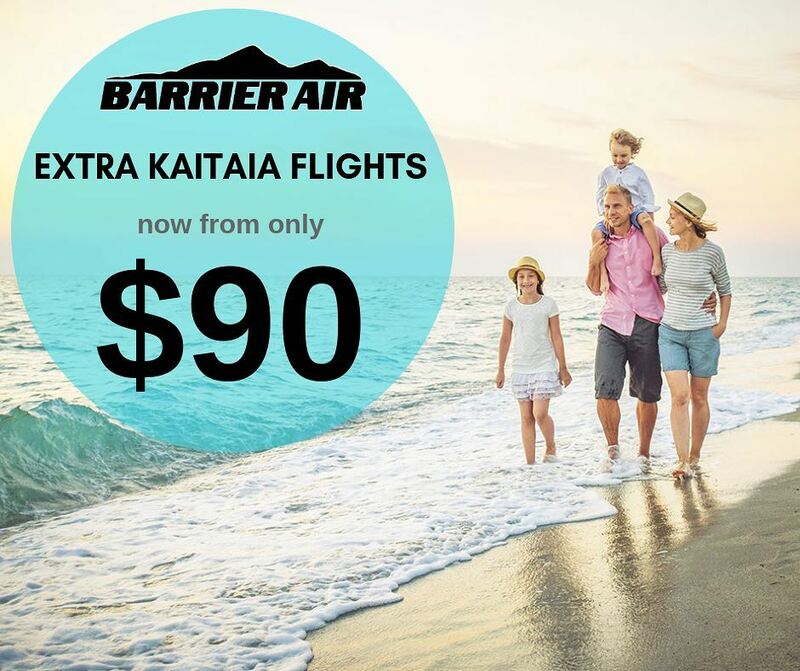 The new Saturday service means Barrier Air is now operating flights to/from Kaitaia 7 days a week. Regular fares start at $90. Brilliant news. 3 flights back to AKL on a Friday, awesome!